– The case can be used to temporarily cover the Virb like a lens cap while the Virb is on a monopod waiting between recordings. – you can attach a strap to it for your backpack, etc. – Proudly made in the USA by Pelican. Comes with a lifetime guarantee. PLEASE NOTE THE DIRECTION that the lenses are facing. Do not face the lenses to the cradles – they could be scratched! 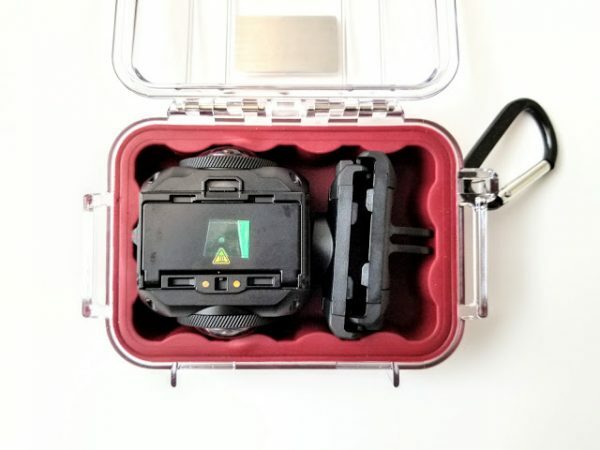 Alternatively, you can also remove the red rubber lining and instead use the foam that came in the Virb 360’s box (you’ll need to cut it to fit the Pelican Micro 1010). If you’d like to buy the case, you can buy it here. Thank you for using the affiliate link to buy the case, which supports 360 Rumors at no additional cost to you. Great suggestion — just bought one with your affiliate link. Thanks! Thank you very much Dan! I really appreciate it! Thanks Vladimir! I think you will be pleased with it!